Setting up your company expense policy can be a complex process for finance teams. You need to figure out which expense categories to reimburse, how keep your expense policy up to date and how to handle work related travel. One category that often gets overlooked is mileage allowances. Mileage allowances apply for work-related trips made by employees in their own vehicles. So how do you define them for your company? The good news is that a certain ‘approved amount’ of Mileage Allowance Payments, or MAPs, can be paid out without having to be reported to the tax authority, which is meant to offer an economical way for businesses to invest in the travels of their employees. When do trips qualify for tax-free mileage allowances? It’s easy to know if trips can be counted against the set amount of mileage allowance that’s exempt from taxes — they just need to pass the following tests to see if they have a business character. It doesn’t matter if you have people occasionally making a trip using their own car or are using it constantly — keeping track of their mileage can quickly get messy. Luckily, there are are very clear rules in the UK about turning MAPs into valid tax-exempt reimbursements, also known as the ‘approved amount’. For the first 10,000 miles, cars and vans are eligible for 45p per mile, and all travel is at a rate of 25p per mile. For motorcycles and bikes, the rates are the same for all travel — it’s always 24p for motorcycles and 20p for bikes. If it’s still unclear, or if you have a hard time calculating how much you can save on taxes, check out the official working sheet for the right mileage allowances. It’s important to note that if the company doesn’t cover the full ‘approved amount’, your employees can apply to get Mileage Allowance Relief for the unpaid part. Just like many other things related to taxes, you won't be able to get anything refunded from HMRC if you don't carefully log the trips you make. Keeping a mileage logbook doesn't have to be complicated, however – you just need to follow some simple rules. All journeys need to be logged with a date, purpose (business or personal), start point, destination and total miles travelled. While HMRC doesn't require companies to file detailed logs every year, you do need to keep them for at least five years after the yearly tax submission date, as you can be requested to show them during an inspection. 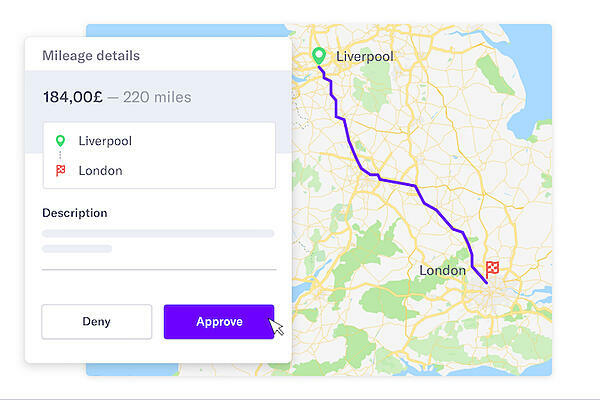 If you manage a large number of employees, or your employees frequently use vehicles to travel for work, consider using a centralised platform such as Spendesk to manage mileage allowances and general travel spending. Employees save time on the road with access to smart payment methods, clear approval processes and digital tracking of receipts and mileage claims. Back in the office, the finance team stays in control with simple payment reconciliation, integrated accounting and a real-time overview of company spending. Want to learn more? Read about the smart ways modern CFOs easily optimise travel spending.